We thank one and all who came to help us celebrate thirty great years at our anniversary party held at the Magnuson Grand Hotel near Carlinville this past May 5th. It was a great day (rain not withstanding) as many of her friends gathered to honor Lorraine Jackson for her work in rescuing and finding loving homes for nearly thirty thousand animals over the past thirty years. That works out to roughly a thousand animals per year saved from an uncertain fate and given a new lease on life. In baseball that's the equivalent of batting 1000 for 30 straight years. 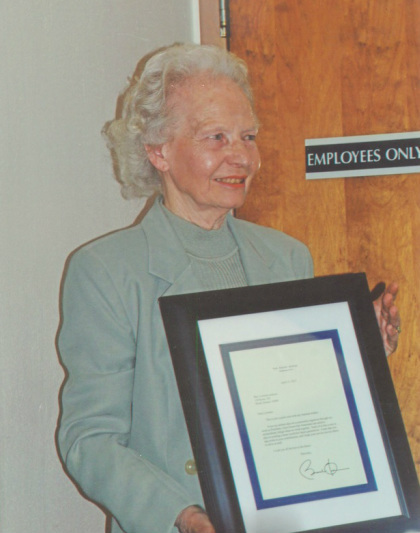 We think that Lorraine should also have received the "Silver Slugger Award" for this feat. Of course, even Lorraine couldn't have done it all by herself, as she would be quick to tell you. 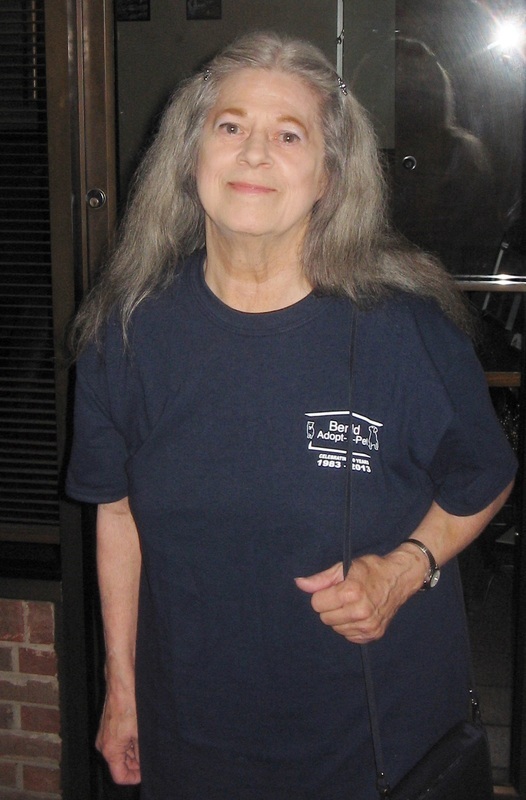 She has been fortunate in having had the support of a great Board of Directors, a hard working Shelter Staff, a number of dedicated Volunteers, a very supportive Membership and, many, many others who, over the past thirty years, have contributed in so many ways to making Benld Adopt-A-Pet one of the best little shelters in the country. Sign in the lobby, welcoming guests to our 30th Anniversary celebration. Our founder, and Shelter Director, Lorraine Jackson enters the hotel. She sure doesn't dress like that at the shelter! 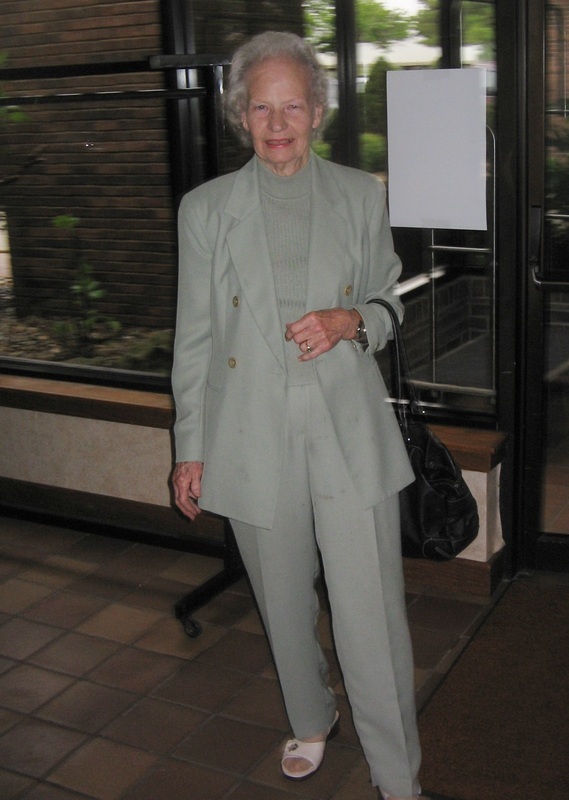 Assistant Shelter Director Judy Hendrick arriving at the hotel for the anniversary celebration. Is that her bowling ball dangling from her shoulder? From left; Treasurer Lori Ortman, Member Joe Koval, President Karen Barnett, Member Carol Richards, Vice-President Lorraine Jackson, Member Monte Oberman. Secretary Lisa Lange was absent. From left; Standing: Pat Chasteen, Candace Pierce, Mary Doty, Calli Lassiter, Donna Saxton, Savannah Dawson. Linda Trigg was not present. From left; Seated: Assistant Director Judy Hendrick, Director Lorrain Jackson, Office Manager Vicki Grove. From left; Standing: Karen Barnett, Charlotte Smith, Rose Hutches, Lori Ortman (peering over Rose & Karli), Karli White, Carol Richards, Joy Laughlin, Lorraine Jackson, Reshoma Banerjee, Eloise Senyan (behind Marlene), Marlene Johnson, Bill Castagno, Judy Hendrick. From left; Seated: Dee Lazarus, JoAnn Small, Jack Small. 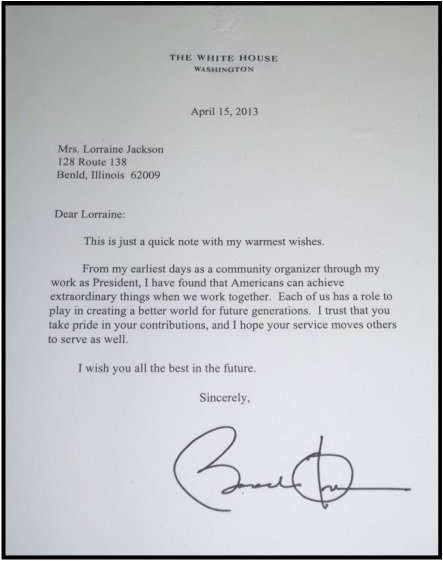 Lorraine displaying the letter of congratulations that she received from President Barack Obama. Lorraine receiving her Lifetime Achievment Award from long time member and supporter Larry Baldwin. We just couldn't bear to cut this one. Fortunately, we had several others to choose from. Here's the doghouse... but where is Spot? Maybe he's inside taking a cat... er... dog nap. Looks as though the doggies won this game of tic-tac-toe. This kitty is fixing to sample the appetizers. Charlotte Smith taking a brief break from getting everything organized to have a little fun. Lori Ortman taken by surprise while, at the serving table, Charlotte Smith and Karen Barnett look on grinning. Music for the event was provided by Kelley Hatlee and our own Monte Oberman. Some of the many clippings, etc. collected by Lorraine Jackson over the past 30 years. 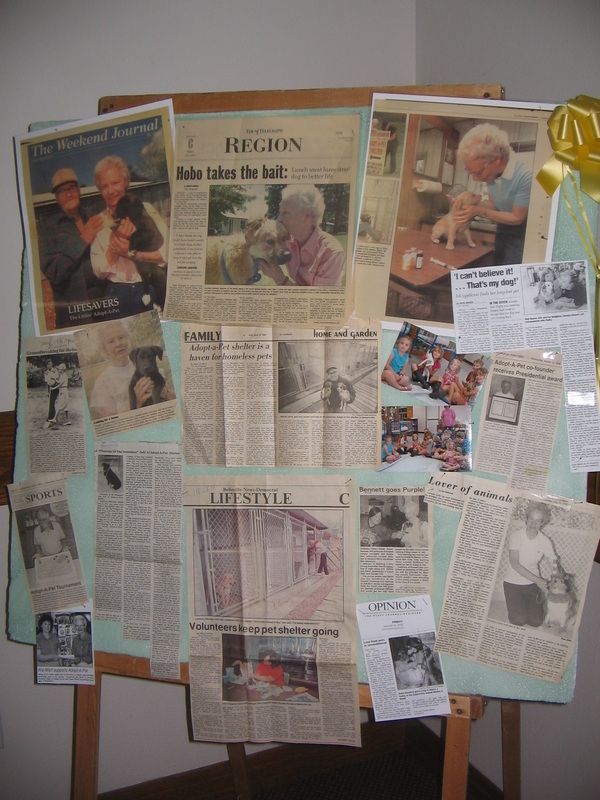 More of the numerous write-ups that Lorraine and Benld Adopt-A-Pet have accumulated over the approximately thirty years of the shelter's existence. 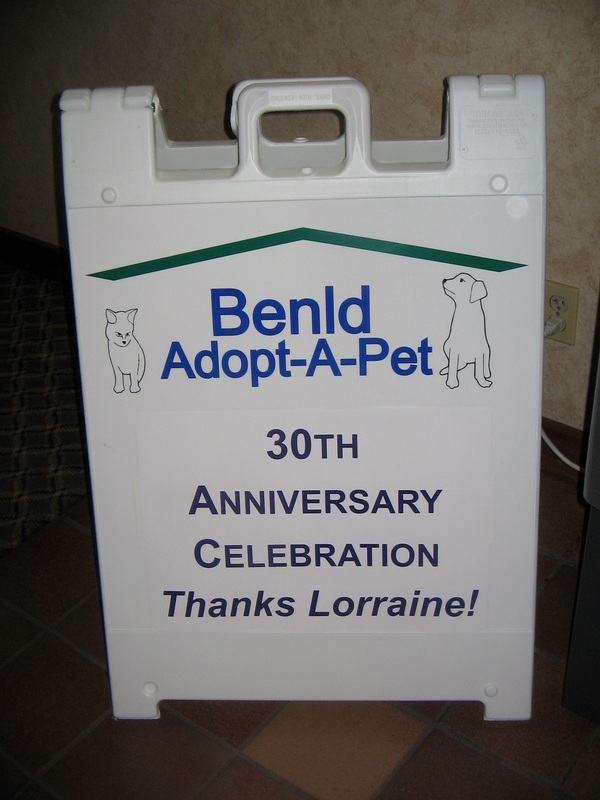 And here are still more of the enumerable mentions that Lorraine and Benld Adopt-A-Pet have garnered over the span of the past 30 years. Thanks for 30 great years! One of the table centerpieces created for the occasion by our very own Lori Ortman. Thanks to Rose Hutches and Dee Lazarus for their contributions to our photographic record of this memorable weekend.